Blending Korean culture and philosophy with traditional Taekwondo, Master Jung & Master Yu's school offers unique martial arts training. Our goal is to help children and adults build self-confidence, respect, good listening skills, strength, flexibilty and coordination, all in a fun-filled environment. Classes are open 7 days a week for all ages. Our School is a Member of better Business Bureau. We offer quality, certified Instruction, convenient schedules, Personal Training, and much more. 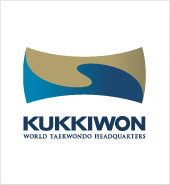 Many achievements in Taekwondo Society. Kinder Kick (5,6 years old) - A dynamic class that focuses on 8 attributes: Focus - Teamwork - Memory - Self Control - Balance - Discipline - Fitness – Coordination. Lessons are customized to grefor . These classes are motivating, disciplined, and most of all FUN!! Children (7 - 12 years old) - These classes are structured to motivate and teach your children what it takes to succeed in life through hard work and dedication. Each class builds upon the basics of physical and mental progression. As your child works up to new levels, they will also be achieving both physical and mental strength to handle everyday life skills. Our children programs are like no other and are highly sought after. Come in for a Free Trial Lesson and see for yourself how we can help you and your children be the best that they can be. Teen & Adult - Looking for a good program to get you in shape, or are you looking for a modern day approach to Self Protection, may be your looking for a great Sport to have fun with, or just simply want more discipline in your life to get more focused, energized, de-stressed; or maybe all the above. Then come in for a Free Trial Class and see what we can do for you. Our highly motivated classes can get you back in shape, teach you a great activity, while learning effective self defense skills. Our team of Instructors are dedicated to helping you achieve your goals whether it's to reach Black Belt or just to have fun. Come in now to start improving your life and health. Give a birthday party that will change your child's life! 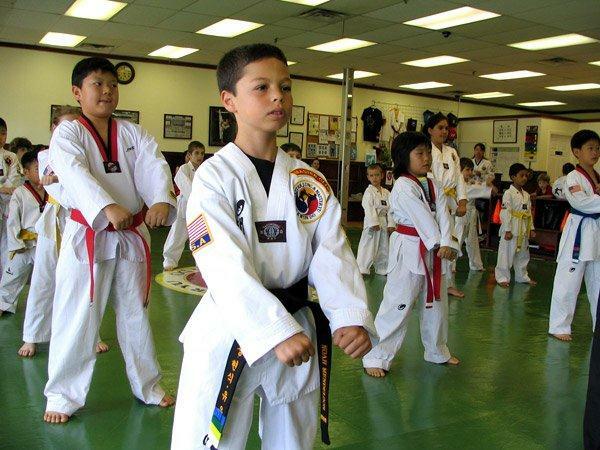 Your child and friends will enjoy an introductory Taekwondo lesson, stretching, kicking, relay games, board breaking, and self-defense. Kids will also learn valuable lifetime techniques, such as healthy eating habits, daily exercise, respect, discipline, confidence and appreciation for their parents. Parties offered on Saturday afternoons and Sunday mornings. Basic Party package includes 90 minutes of fun. Parents are welcome to bring whatever food they choose. Call to book your party today! Master Jung & Yu offers on going classes throughout the year. Please call or check website for summer schedule. Blending Korean culture and philosophy with traditional taekwondo, Master Jung and Master Yu's school is unique in martial arts training. By combining physical with spiritual, we offer the most complete and satisfying training, embodying mind, body, and spirit. Classes are open seven days a week for all ages. Our unique birthday parties open the door for future leaders and martial artists and are available on weekends. Energize your whole being at Traditional Taekwondo. Call for more details. Head Master H.S. 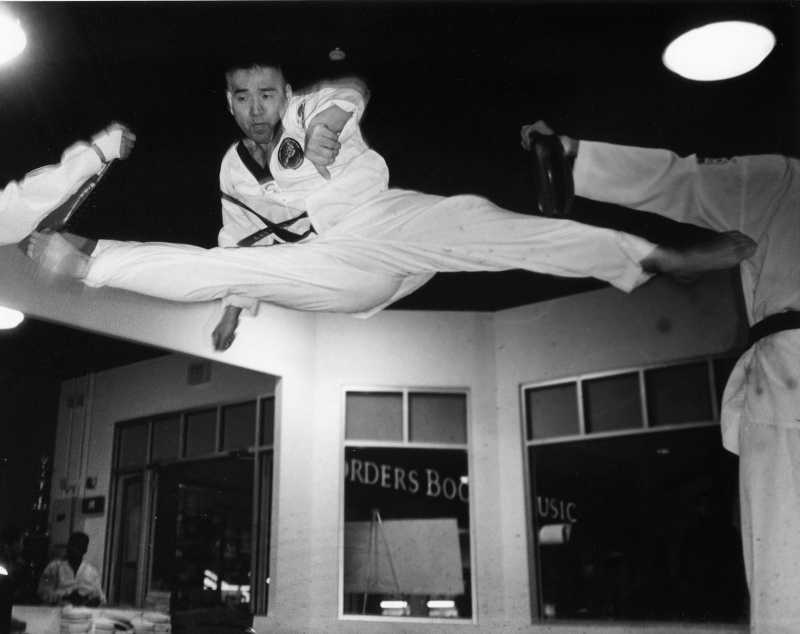 Jung is a sixth degree Black Belt, former Korean Champion, U.S. National Team head coach, and international referee. Blending Korean culture and philosophy with traditional taekwondo, Master Jung and Master Yu's school offers unique martial arts training. Classes are open seven days a week for all ages. Our unique birthday parties open the door for future leaders and martial artists and are available on weekends. Energize your mind, body, and spirit with traditional Taekwondo. We will offer a variety of summer classes—please call for more details.